Life is in the little details, or so the saying goes. We go about our day thinking about bigger and brighter things—when the next paper is due, where we are going to meet for a date, what we are having for dinner—and often times overlook that which is foundational to a sense of normalcy. We ignore the small things that make our life ours. Try to think about it: what is one small thing that, if absent, would make your day feel off? Maybe it is patterned duct tape, maybe it is the salty smell of the ocean carried by the wind through your window, maybe it is the secret ingredient your mom uses for that special dinner you love. For me, it is churros. 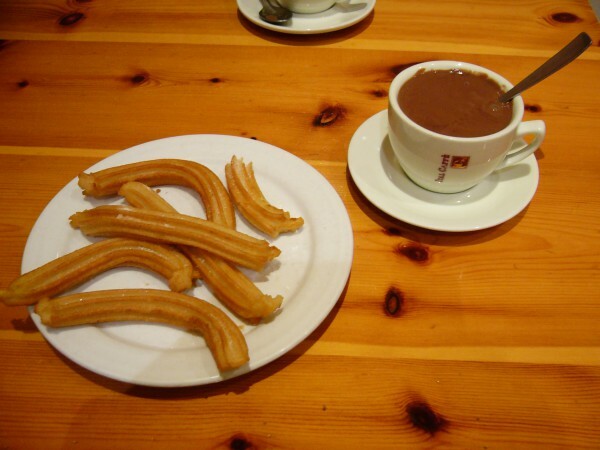 Churros are fried pastries that originated in Spain. They are elongated and thin and have ridges because when they are made, the dough is funneled into an oil-filled pan through a baking sleeve that has a star-shaped nozzle. Churros are topped with sugar or dipped in caramel or chocolate. Some people like to roll them in cinnamon or drink them with hot cocoa and coffee for breakfast or snack time. These pastries are usually sold in churrerias or from street carts in Spain and Latin America. In my country, Venezuela, we have specific stores dedicated to selling churros and I, as a child, used to visit them occasionally with my sister and my mother. I wasn’t a big fan of churros growing up. While I enjoyed them, they were a rarity for me and did not form part of my home culture. It was just one more store we passed by the mall that sold yummy things—a business with the magical power to make that dessert that my mother and I once or twice tried to make but had seared in oil. Churros were just…there. When I moved to the Duluth, Minnesota for college, churros were the last thing on my mind. I was too distracted by all the novelty the United States could provide: stocked shelves at the supermarket, the sense of safety going around town at any time of day, and brightly-colored aisles devoted to M&M’s, Reese’s, and other candies that were foreign and rare to me. Starting college did not allow for much time to think about churros either, and so two years came and went with churros only coming up in conversation maybe twice when speaking to other international students about how different life in Duluth is compared to home and how sometimes we miss the simple pleasures of feeling a supermarket is yours instead of feeling relegated to an ethnic food section. One fateful day, my friends and I made plans to meet for dinner at the cafeteria of our college. I went down the stairs and basked in the smell of melted cheese and toasted corn and, thinking it’d be Taco Tuesday, I strolled in and there they were: a plate of inch-long, cinnamon-covered churros. They were toasty and brown and warm and I could not help but tear up when I looked at them. It was like a long-lost lover reunion with a small mountain of doughy deliciousness. Ecstatic, I told all my friends. I told the other people in line. I came up to the person in charge of the cafeteria and hugged them. I was in Duluth, Minnesota, where the Hispanic isles carried Taco Bell desserts, and I had found a homely dish that, though quite different from what I was used to at home, came close enough to the original to click in my soul. That night I had about twelve churros and a tummy ache, but I also realized how important these little desserts were to me. It was not only about food, or nostalgia. It was a matter of representation. Seeing a piece of home after such a long time in such a remote place was like a validation of my existence. It was a symbol of lazy weekend afternoons with my family strolling in a tiny mall; of hunting to find the ingredients for recipes when milk, eggs, and sugar are scarce; of the life I used to live. Seeing it on campus, my new home, was proof that I had once led that life. It was a reminder of how we can live comfortably in bubbles of reality we have created, forgetting or not realizing that the little details in our lives make them what they are or that people from other places don’t have the same little details or even big details like shelter, water, and safety. I never have really had this experience because I have never been abroad for an extended period of time. However, I can definitely see how such a little thing would bring you back to home. I’m glad you had this experience. I can totally relate to your experience Maria. Like you mentioned, it is the representation that matters. I have noticed that it is the small things that sometimes make our days or lives happy.I can imagine the happiness you were filled with when you saw home food. I am glad you found churros at CSS. That’s very cool that something so small can mean so much to you. While in school it is hard to remember all the little things that you left, and it brought you great joy to see those churros. I imagine that the tummy ache was definitely worth it! Thank you for sharing your experience Maria. It’s crazy how the little things can bring back memories for us. I don’t think I have ever had this profound of an experience with it but definitely since I have come to college I have a new appreciation for food, and other things that remind me of my family. “It was a reminder of how we can live comfortably in bubbles of reality we have created, forgetting or not realizing that the little details in our lives make them what they are or that people from other places don’t have the same little details or even big details like shelter, water, and safety.” This quote really stuck with me because I can really relate to it. Coming from a home with mixed cultures, it’s strange how much you miss food you never real thought much about. I remember thinking the same thing about kimchi when I first started college. It was something that was always served and it seemed to be on the kitchen table every night for lunch or dinner. Jumping into college, people rarely knew what it was and the stuff they did know was the Cub Foods version. I guess in a way, it was a part life that you never expected to miss but also never expected to loose either. I’m not sure why food is so important to us, but it’s one of the things I miss most about home. I’m sure a lot of people can relate this feeling. This is a great story about the little things can remind you of home and they make your day just that much more special. I may not be from a different country, but I am far away from home and I know the little things that remind me of home make my day just a little better than it was before. You also made a good point saying that we overlook the little things in life and that we seem to overshadow them with other events or obstacles we face in our lives. Maria, that was precious. I nearly got teary eyed hearing when you said you got to have churros in the cafeteria. I have had experiences similar to that but not as profound. I completely agree how life is in the little details and I think we all ought to pay more attention. Maria you are absolutely right, we do ignore the small things in life. I’m so glad to hear that there was something at CSS that reminded you of home! I hope your experience at CSS has been enjoyable! A new meaning to “comfort food.” Possibly, food that simply reminds us of home. For me, it is banana cake and banana bread which my mom prepared for my sister and I every time we returned home from college for the weekend. I think this is a great article does a great job of showing just how the simplest of things can make you very happy or spark a memory. I am glad something here could remind you of home. I really love your story because I can relate so much with you. I grew up eating traditional Hmong dishes and American food. Coming up to Duluth for college, where there is barely any Hmong-Lao store/restaurant made me realize how much I miss traditional Hmong dishes. So when my parents come up from the cities to visit, they always make sure to bring my favorite dishes so I don’t get homesick too much in Duluth. This article does a wonderful job of displaying how memories and things we’ve forgotten about can flood back by something simple. I loved reading this article and am glad that you were able to have this experience. This reminded me of the time I had sadza (Zimbabwean dish) months after living Zimbabwe! Because there is no place that serves Zimbabwean food, we usually get to do some Zimbabwean get-together dinners once in a while. However, after reading your story, I really want to try churros! I both loved and also despised this article as now I am extremely hungry for something sweet! For me Lake Superior is something I too often take for granted as it is visible daily. However when I travel to see family even for a short amount of time I yearn to see Lake Superior and Duluth’s wilderness. This has reaffirmed that it would be very hard to for me to move away even though the winters can be brutally long. I understand how you feel about food and about certain customs of our home countries. The same thing happened to me when I came first to the United States. I was so excited to have the opportunity to go to places like olive garden or buffalo wild wings that are rare in our countries. But after a while a nostalgia of home, of your family and of things that used to be your own daily life makes you value what was once yours. Everytime I go to the cities and see colombian restaurants or arepas my heart just starts beating so fast! Is like having a piece of heaven that reminds you of your family and friends. That is really cool how they did that for you! I mean you do not see a lot of that anymore. I feel that if I was to go to Spain that is something I will try and I bet that made you feel like home when you came down to see that. I enjoyed how you were able to describe the different realities one might go through in life by using food. And I loved how you were able incorporate so many emotions and sensations around churros! In my opinion food is one of the greatest comforts while being abroad, and there isn’t a word to describe just how good it feels when you are eating something from home. I like how you have a reminder to all of us that even the simplest things in our life can have so much meaning and we may not even know it. We take so many things for granted; things that, like you said, if they just simply weren’t there one day, we’d feel of. It’s a good habit to be thankful for everything you have and appreciate the things and/or people that are in your life. It was very heartwarming and enjoyable reading your article. Thank you Maria for reminding me of foods that represent home, safety and contentment. My mother was a child during the great depression when food was scarce and self sufficiency meant survival. When I was growing up my family had a garden and we raised our own beef, pork and chicken. Often Mom made pinto beans and Johnny Cake (corn bread) for supper. She called it “poor mans meal” but to me, warm Johnny Cake with melted butter and homemade blackberry jam and a bowl of pinto beans slathered in butter and sprinkled with salt and pepper represented home, safety and contentment. The riches we so often neglect to be grateful for. Your experience of being in a completely different culture far from your loved ones and searching for small reminders of home is an eye opener for me. Your description of how we “live comfortably in bubbles of reality we have created, forgetting or not realizing that the little details in our lives make them what they are or that people from other places don’t have the same little details or even big details like shelter, water, and safety” gave me pause to appreciate the little things that make today’s bubble of reality a more enlightened place. Now I am craving pinto beans and Johnny Cake. Maria, I agree that there are many little things that we take for granted everyday, and food is perhaps one that we think about the least. I realized this when I came to college my freshman year and I didn’t have the homemade foods I was used to. When I moved back up to Duluth this year I made sure to bring some food from home including: beef grown in my hometown, sweetcorn that I picked myself, and my grandma’s homemade jelly. It’s amazing how the smallest things can bring us the comfort of home. Beautifully written! I loved your introduction! It drew me in and made me think of what is important to me that is usually of small significance. I can’t imagine being so far from home and what small things I would miss. Thank you for sharing your emotional connection with churros. I really enjoyed the way you started this article. I took a minute to step back and think of those things that would et my day off if they weren’t there. Crazy to think just how many little things that would do that. It’s amazing that you never really thought about churros but then the smell hit you one day. It’s amazing what can give a sense of home. I think this is a great article on perspective as well. This is a really cool experience, and especially that you were able to find food from your home halfway around the world. I have had similar experiences when I go home and my mom or grandmother cooks traditional Italian meals. There is something very deep inside of us that connects foods to experiences and people, and I think it is so cool that you were able to find that here in Duluth. I loved reading this article because I totally agree that we often overlook the things in our life that we just expect to be there and present within our lives. By your description, churros sound absolutely delicious and I hope to try one someday! A food in my life that plays the same part as churros do in yours would probably be banana bread since my mom makes that for my brother and I every time we are home. I have heard that saying at the beginning a million times, but nothing has really put it into perspective for me. Your story did a great job of putting that into words and making it easier to understand. Having something as small as a food item that you rarely thought about show up and spark emotions like that is wonderful. Even though I am not nearly as far from home as you are and do not yet feel that disconnect from being at home, the idea that something like that can have a nostalgic effect is somewhat comforting. Thank you for sharing! What a beautiful article! As an international student myself I can relate to what you are speaking of. Food I think holds a very important and special place in our identity and memory. Even if we do not usually give it much thought, there are times when we can see how deeply it is imbedded in us. Since the first day I came to CSS I have had a freezer stocked with food from back home, sometimes I think of it as my lifeline and connection to my home. I now feel bad about ever complaining about food back home. I can relate so much to this. Food holds a special place in so many cultures. I’m glad you were able to share this experience that you had. I was moved by it. When starting to read this article I was ready to be averagely pleased. However, finishing it I had tears in my eyes and was quietly laughing to myself. This is a beautiful article Maria. I don’t know if it’s because I know your story and where you are coming from when you write this of why this touched me so emotionally but I think its more than that. You write about the identity of a person and how important it is to be reminded of where you come from no matter where it was. Thank you for writing this, and making me want to eat churros now. Maria, thank you for sharing such a beautiful story! You make an excellent point about how we can tend to take the little things for granted. I was also struck by how we can so easily forget about the small things from home once we are away. But when they are brought back to our attention, something unnoticed for a long time can trigger a deep emotional response. Again, thank you for sharing and remind us all to be mindful of little pieces of home. I totally agree with you that we often take things for granted. I think that it is very neat that you were able to find food thats from your home country even though you are halfway around the world. I know that if I was halfway around the world I would want some food that my family made for me. I thought this was such a beautifully written article, and I was very grateful for the opportunity to read it. I think food is such a comfort, and I can imagine that going somewhere where something you are so used to having is gone can be a culture shock. In our Tignor World’s Together, Worlds Apart we are learning about how culture has spread across the world. This article made me think about how churros are an important part of your culture, but only something I ever see at a theme park up here. It made me reflect on how only some elements of some cultures spread, and what an interesting phenomenon that is.